Grandpa enjoy showing off all of his grandchildren when he wears his Hunting Personalized Sweatshirts at the Hunting Club. Our Hunting Customizable Sweatshirts are available on our premium white cotton/poly blend Personalized Sweatshirt , machine washable in adult sizes S-3XL. Also available in Ash Gray. Includes FREE Personalization! 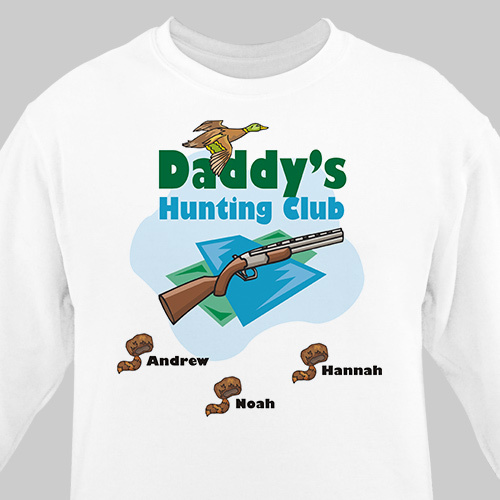 Personalize your Hunting Sweatshirt with any title and up to 30 names. Came out Great. Was excited to get all the kids names on it. These Personalized Fishing & Hunting Gifts are perfect gift selections for Birthdays, Anniversaries & the Christmas season. Be sure to look at our entire collection of Personalized Fishing And Hunting Gifts for Him. GiftsForYouNow.com also carries additional Personalized Coffee Mugs. Shop GiftsForYouNow.com for all your Birthday Gifts & Father's Day Gifts.